University Avenue at Park Blvd. Clearly our streets are too small for bike lanes. And how would bikes fit with so many cars? Since the original announcement SANDAG has repeatedly trumpeted these funds as a sign of commitment to healthy transport in the form of bicycles. During the time since Uptown was selected for the first SANDAG bicycle project what has changed in the area? Population, businesses, traffic, and roadways all remain the same. There remain only two real options for an East to West connection – University and Washington. What has changed in that period is the will of SANDAG and the Transportation Committee to support and implement real bicycle infrastructure. SANDAG is now taking unilateral action, walking back any commitment to bicycles for this corridor and setting a poor precedent for the future. Worse yet is the toxic effect this will have on the many, many San Diegans that spent thousands of hours attending the public forums to give input and show support for this improvement in Uptown only to be trumped by back-room dealings hidden from the public eye that gutted the project in recent months. We need safe streets today. There are too many deaths, too many injuries, and too little justice (or even simple apologies) to those left dead or injured. We are a real, vibrant, beautiful city – not a collection of suburbs. We need to behave as such. SANDAG is doubling down on the failed policies of 50 years of planning and building roadways in our region. More and wider roads, more cars, more congestion. Less open space, weaker communities, a weaker economy for both households and government, and more deaths and negative health impacts. This is the most recent example of a car first-last-and-only approach to transportation. San Diego has many natural advantages that blunt the effects of these poor policies. These will not last forever. Cities such as Vancouver, Seattle, Chicago, New York, Paris, London, Stockholm, and many others showcase the real, tangible benefits derived from creating a livable and safe streetscape and city. San Diego and SANDAG should take a page from this leading example and do the same, backed up by the allocation of funding and policies. The opposite is the reality. The lion’s share of all money goes to cars and roadways for cars while all other modes are made to beg for scraps or sue to compel what should be the course being set by our own leaders. We need to create a true network for bikes, starting with University Avenue. It will be a major step forward to improve our city and the individual well-being of our citizens. 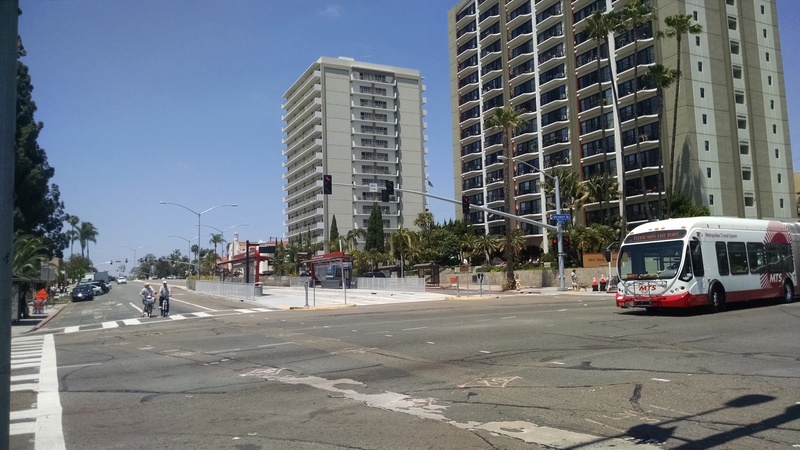 If SANDAG is unable to implement the Uptown bicycle corridor with real, safe bicycle infrastructure throughout this $40 million should be moved to a different neighborhood where such a project can be realized. If you can’t walk the walk, stop talking the talk. Greenwashing is not a substitute for responsible, forward-thinking action. More than two and a half years have passed since $200 million was promised for bike projects by SANDAG. 77 miles of bikeways in 42 projects was promised to be finished within ten years. Where do we stand today? Without a single foot of paint striped and the first project gutted and providing a maximum of three blocks of protected bike lanes. A poor omen for the future projects, unless the desire to see a bicycle network was not genuine in the first place. Hopefully the remaining projects will see real, on-the-ground results in quick order. I would not hold my breath. Previous Previous post: Home-Swapping – Now Banned in Carlsbad, San Diego Next? Next Next post: Own Property in San Diego? Get a Free Street Tree!